Yes. To do so, you must first create a Spotify Group within the Play-Fi app. 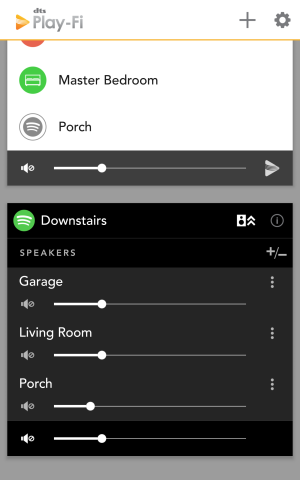 Spotify Groups are different from normal Play-Fi groups in that they specifically group speakers together for viewing within the Spotify app. This is so that normal grouping and zoning functions remain modular within the Play-Fi streaming system. From the Play-Fi Control screen of the Play-Fi app (left), tap the Settings button to open the pop-up menu, and select Spotify Groups, which we’ve circled here. This option allows you to edit or create Spotify Groups. 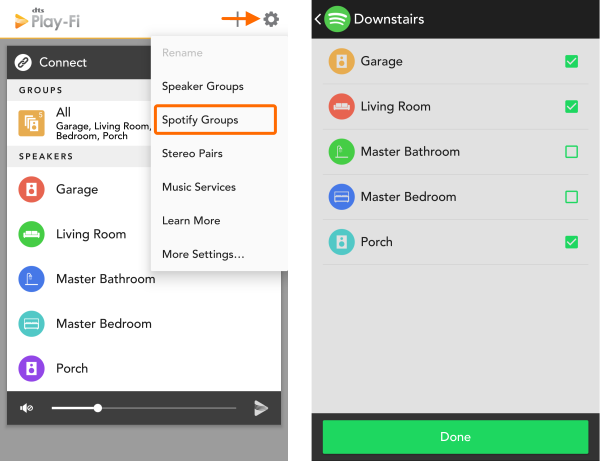 After you've elected to create a new group and given it a name (we called ours "Downstairs" in the example) you can then pick from any of your Play-Fi products to be added to this group (right). Any speakers that can't be joined in a Spotify Group will be greyed out. Once you’re satisfied, head to the Spotify app to start streaming.